The US media has been overwhelmingly positive about President Macron's visit to the White House this week. Conservatives saw him as business-friendly and while the liberal press had watched what has been called the Macron/Trump 'bromance' with a slightly jaundiced eye, wondering what Mr Macron was hoping to achieve by such comprehensive buttering up, his performance when he was invited to speak to Congress (similar to France's National Assembly) won them over too. In his 50-minute speech he hit out at climate change scepticism, predicting America would rejoin the Paris agreement, asked the US to stay in the Iran nuclear deal and criticised isolationism and nationalism, urging America to engage more with the world. 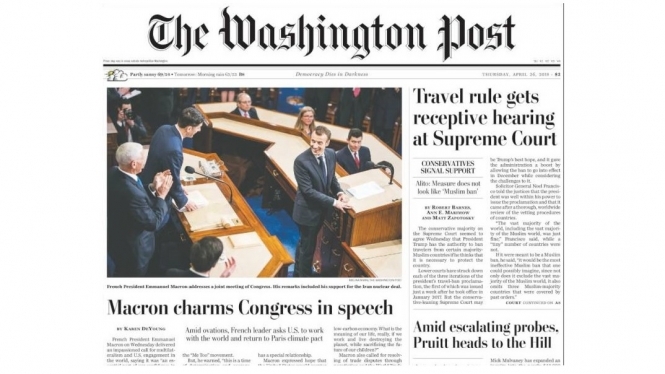 The liberal-leaning Washington Post published a photo of Mr Macron receiving a standing ovation captioned 'liberté, égalité, frenemé – implying he is at once a friend and enemy to Mr Trump. It cited Richard Hass, president of a leading US international relations body, saying Mr Macron had successfully positioned himself as 'leader of the West', although the Post also noted that no-one was really expecting Mr Trump to take any notice of anything Mr Macron or anyone else says (Angela Merkel is due to visit Mr Trump for talks next Thursday). The Post also noted that it did not think Mr Trump would have understood most of the speech. Right-wing, Trump-supporting, Fox News took the line that the Trump/Macron 'bromance' was no surprise, with Newt Gingrich stating that both men are committed to dramatic change in their countries and both are businessmen and value the free market. He said they face very different challenges however: Mr Trump has to deal with an exceptionally hostile press, while Mr Macron faces disruptive, destructive union action. However overall he took the line that “Trump and Macron are the two leading reformers on the planet today and I suspect both men will feel strengthened and emboldened by the time they have spent together this week”. The New York Times was similarly positive, noting in an editorial that Mr Macron had obviously planned his 'bait-and-switch' move some time in advance – it said he arrived with “hugs and kisses” before “rising before Congress to deliver a stern lecture”.